Water Is For Wussies…Then Call Me Miss Wussy. I am really starting to get tired of the cramping I get from time to time on the right side. It seems to occur every Wednesday morning for some reason (and occasionally other days as well). I know I probably did not drink enough water and Powerade on Tuesday which didn’t help my work out on Wednesday morning but it seems like it is the same story every week. I guess I should try to pay extra attention on Tuesdays to my drinking habits. To help fix this issue I did recently buy two new water bottles to help with keeping me hydrated. 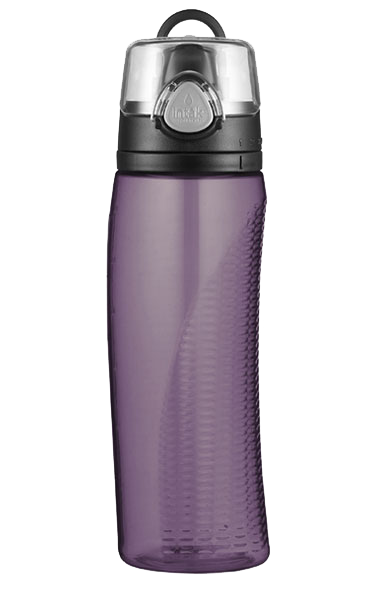 They are Intak Hydration bottle by Thermos and I love these things. They have a nice lid that is easy to open and lock when needed. The Intak bottles also come with an intake meter that helps you keep track of your water consumption for the day. (This is helpful to me because I found myself forgetting how many times I would fill up my water bottle at work) I usually have one at work and one at home to try to help me remember to keep drinking water throughout the day. It does seem to be helping quite a bit if I remember to use them. Hopefully if I can get this whole hydration thing down the cramping will go away completely. I do fear occasionally this cramping is caused by something other than my hydration level or food intake but I guess that is on the list to discuss on the next doctor’s visit. I do have some existing news to share. I will now be on Twitter and Facebook with comments on my training, posting articles/websites I come across about running and probably any good shopping deals I come across as well. I definitely still plan to make my usual blog updates on here but just thought this addition would help get the word out and help others stay motivated to keep moving! So check me out on Twitter @MS_Runner or on Facebook as MS Runner. Also feel free to contact me directly at lisa@msrunner.net.